Arch. Jose Ferrandiz, Adaptive Learning Case Studies Implementation at Architectural BIM Construction Courses, February 20, 2019. 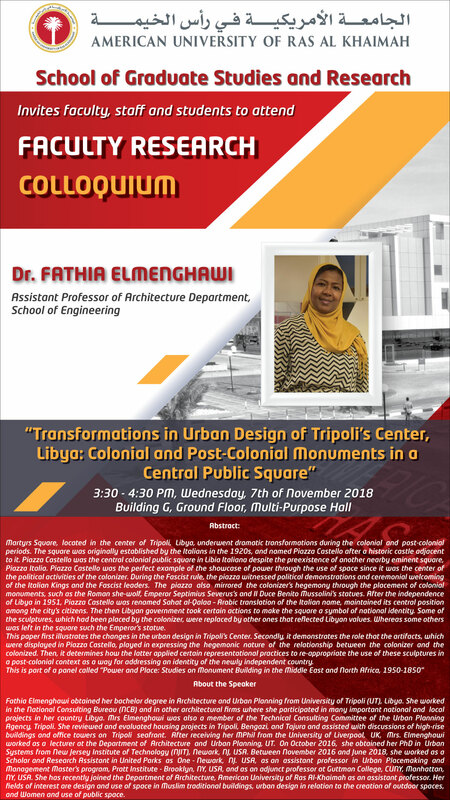 Fathia Elmenghawi, Transformations in Urban Design of Tripoli’s Center, Libya: Colonial and Post-Colonial Monuments in a Central Public Square, November 7, 2018. Mashhad Al-Allaf, Al-Khazini and Newton on the Center of Gravity, October 15, 2018. Moayyad Al-Nasra, MOSERAT – The Water Reserve of the Desert Air, March 19, 2018. Imed Louhichi, On the Influence L1 Training onto L2 Learning: Evidence from the Use of ‘from’, ‘out of’ and ‘off’, February 21, 2018. Hurrem Yilmaz, Consumer Boycotts: Promotion Versus Prevention Focus, December 6, 2017. Jose Ferrandiz, The Introduction of BIM Tools at the Architectural Department: A Mixed Method Research to Evaluate and Improve Introduction of ICT at the Architectural Program, November 19, 2017. Ali Maalaoui, Energy Concentration and Bubbling Phenomena in Critical Partial Differential Equations, November 8, 2017. Moayyad Al-Nasra, Conceptual Approach to Forensic Engineering, March 8, 2017. Hurrem Yilmaz, The Effects of Centrality and Distinctiveness on the Usage of Co-promotions, November 14, 2016. Zakaria Al-Qudah, Internet Path Stability: Exploring the Impact of MPLS Deployment, November 7, 2016.  Fernando del Ama Gonzalo, Water Flow Glazing in Zero Energy Buildings, November 1, 2016. Khaleda Al Mansoori, Emarati Dialect and Culture, October 18, 2016. Tariq Shehab, Automated System for Inspection and Repair of Sewer Pipes, October 11, 2016. Larry Griffin, Cedar Plums, May 16, 2016. Maxime Merheb, Biofuel Exploration from Soil Microorganisms in Ras Al Khaimah Mangroves, March 22, 2016. Muhammad Mukhtar, Ranking Universities: Practices, Problems and Way Forward, February 3, 2016. Lee Edward Waller, Surveying Organizational Effectiveness: A Case Study from the United Arab Emirates, November 11, 2015. Robert Arthur, GIS Modeling of Sea-Level Rise in Ras Al Khaimah, UAE: Al Hamra Development, a Pilot Project, September 30, 2015. Junaid Ahmed Zubairi, Flight Data Tracker for Global Aviation, April 22, 2015. Muhammad Mukhtar, Facing and Chasing Viruses – EBOLA and 0thers, March 16, 2015. Elyes Bdira, Cognitive Networking: Application to Wireless Sensor Networks, February 3, 2015. Richard Gauvain, Ras Al Khaimah – An Emirate in Transition, November 26, 2014. Justina Osa, Mentoring and Other Professional Support for Faculty in Institution of Higher Learning: A Study Report, November 12, 2014. Sami Alshurafa, Development of Guyed and Wind Turbine Towers Using Advanced Composite Materials, October 22, 2014.  Robert Arthur, GIS: Definition and Applications, December 4, 2013. Omar Al-Fajjawi, Roots of Human Rights: Models from Pre-Islamic Poetry, November 20, 2013. 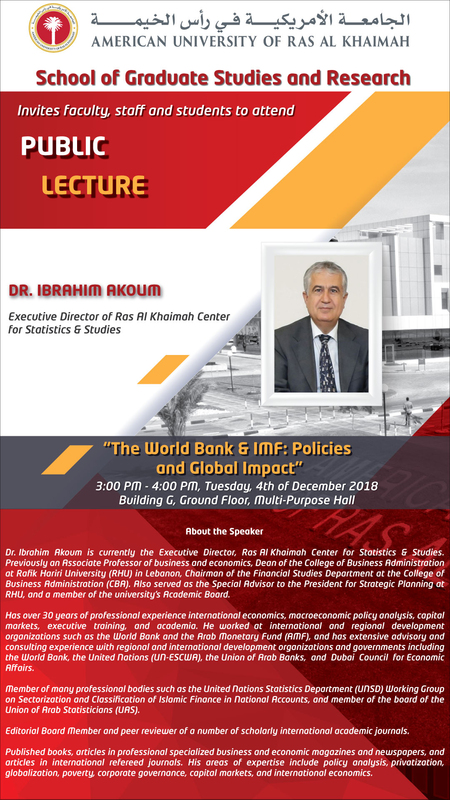 Ibrahim Akoum, The World Bank & IMF: Policies and Global Impact, December 4, 2018. 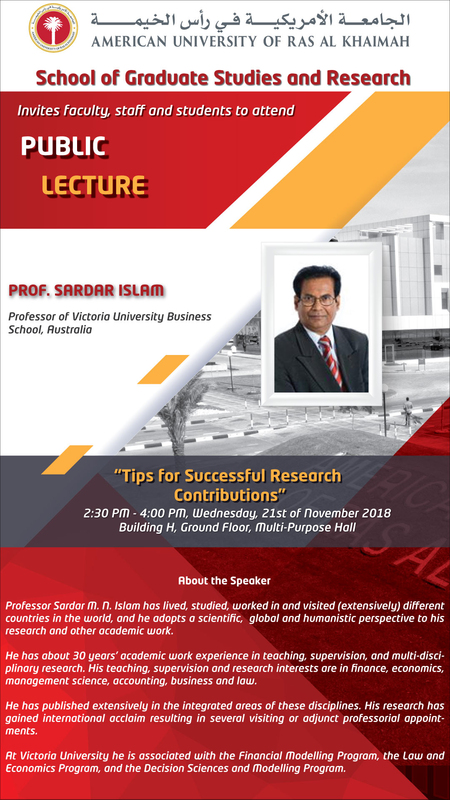 Sardar Islam, Tips for Successful Research Contributions, November 21, 2018. Peter Robert Woodward, The Arabian Peninsula: Challenges on its Western Flank, November 15, 2018. 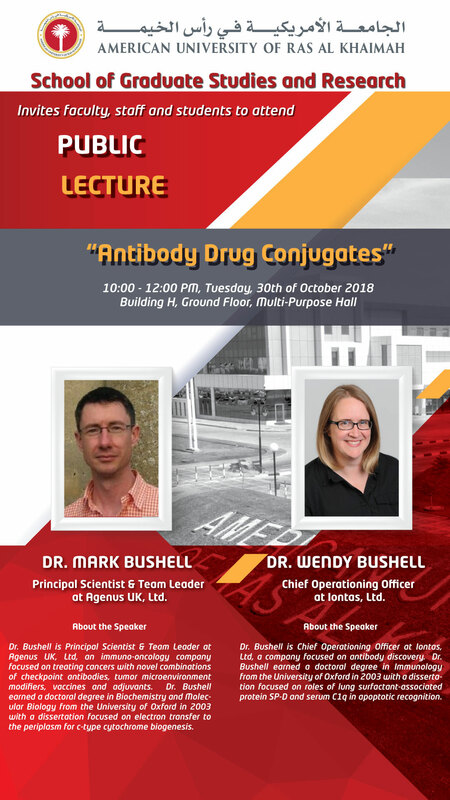 Mark Bushell and Wendy Bushell, Antibody Drug Conjugates, October 30, 2018. Dimitrios Tsagdis, Successful EU Nations, Regions, and Clusters: An Overview of the Interrelations between Competitiveness, Productivity, and Prosperity, March 1, 2018.  Rida Shibli Khawaldeh, Genetically Modified Crops: Current Status and Future Prospect, November 14, 2017. Sheik Rahman, Smart Water Flooding of Porous Fractured Carbonate Reservoirs for Improved Oil Recovery, November 8, 2016. David Neild, A Soldier in Arabia, May 9, 2016. Raed M. Shubair, Advances in Array Processing Techniques for Future Mobile Communications, February 23, 2016. Julian Korab-Karpowicz, Tractatus Poltitico-Philosphicus ends with Seven Principles of a Happy Society, October 28, 2015. Eiyad Abu-Nada, Dissipative Particle Dynamics a Simulation Tool for Microfluidics/Nanofluidics, October 20, 2015. Madhat Abdel-Jawad, Spacecraft Rockets and Explosions: Unexpected Phenomena in High Speed Gas Dynamics, September 15, 2015. Abdulla Ismail, Smart Grid for Smart City, May 7, 2015.  United Brands/Omnix International, Autodesk Applications, April 29, 2015. Fady Alnajjar, Neural Synergy: The Advanced Platform for Motor Function Recovery, April 27, 2015. Neven Duic, EU Energy Policy and Smart Energy Systems, March 25, 2015. Abdulla Ismail, Undergraduate Research Applications, March 18, 2015. Suk-Hee Yun, Nothing but Architectural Dialogues, March 11, 2015. Nikolaos Mavridis, Intelligent Robots: Present, Past, and Future, March 10, 2015. Tracy Ann Scholl, Imagination in Late Scholastic and Early Modern Thought, March 9, 2015. Jean-Marie van der Elst, Patience, Perseverance & Tolerance, February 17, 2015. Elhadi M. Shakshuki, Agents for Smart Environments, December 16, 2014. Dariusz Dolinski and Tomasz Zaleskiewicz, Applying Social Psychology in Business and Economics, December 9, 2014. Mashhad Al-Allaf, The Maqasid (Objectives) of the Islamic Law, November 17, 2014. Gerald R. Shaye, Opportunities in the Global Marketplace, November 5, 2014. Leszek and Dorota Koczanowicz, Gramsci, Pasta, and Fascism: On The Curious Intersection of Food and Politics, December 11, 2013. Hamad Bin Seray, Emirati National Identity through History, Archeology and Architecture Heritage, November 27, 2013. Yousef Haik, Snapshots of Nanoresearch at United Arab Emirates University, November 26, 2013. Maalaoui, A., Critical Problems in the Sub-Elliptic Setting. Hodeify, R., Puthiyaveetil, A.G., Merheb, M., Matar, R., Marton, J., Yaseen, H., Role of Store-Operated Calcium Entry in Cyclin-Dependent Kinase 2 Dependent Cisplatin Cytotoxicity in Kidney Cells. Berriche, H., Quantum Features of Ionic M2+ (M=Rb and/or Cs) Bound Molecular Dopant in Bosonic Helium Droplets. Dorstewitz, P., Khodr, M., Zdravkovska, S., Manoukian, J., Researching the Effectiveness of Student-Peer Co-Produced Content Videos for Flipped Classroom. Ahmad, I., Waseem, S., Hybrid Adsorbent for the Removal of Toxic Synthetic Dyes from Wastewater.  Louhichi, I., Same-Same Arabic: A Pidgin in the Making. Zdravkovska, S., Arthur, R., Quantitative and Comparative Content Analysis of the Coverage of International News in English and Arabic Daily Newspapers of UAE. Yilmaz, H., The Effects of Oral Haptics on Viscosity and Calorie Estimation in Liquids. Sheikh, A., The Implications of Imminent Organized Labor Provisions on the Industrial Relations Landscape of the United Arab Emirates. Ferrandiz, J., Academic Mixed Method Evaluation and Improvement Process while Introducing a New ICT in the Curriculum. 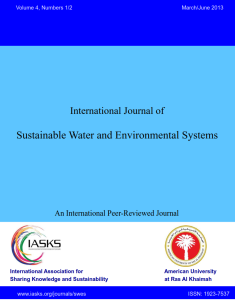 Abdel Azim, R., Tasfy, S., An Innovative Experimental and Numerical Simulation Study for Evaluation of Borehole Stability using Nano Based Drilling Fluids. Balhasan, S., Tasfy, S., Al Zarooni, M., Elbagir, A., Remove Black Powder from Oil Pipelines: An Experimental Research. Tasfy, S., Abdel Azim, R., Elbagir, A., Experimental and Numerical Study for the Application of Metal Nanoparticles for the Enhance Oil Recovery. Sediadi, E., The Vertical and Horizontal Green Heat Isolation. Abu Abdo, A., Evaluation of the Performance of Asphalt Mixes with Plastic Waste. Khodr, M., Waller, L., Complete Purchasing Camtasia Licenses for the Flipped Learning Lab to be used for Training and Research in Engineering Education. Hamad, N., Air Pollution in Industrial Areas. Ahmad, I., Waseem, S., Oxidative Kinetic Resolution of Secondary Alcohols Catalyzed by Chiral Transition Metal Complexes. Waseem, S., Ahmad, I., Solid Acid as a Heterogeneous Catalyst in Green Techniques for Organic Synthesis: An Environmental Benign Approach. Merheb, M., Matar, R., Marton, J., Molecular Identification of High-Lipid Fungi Producers for Biodiesel Production from RAK Soils. Holmes, B., Arthur, R., Gauvain, R., Al Mansoori, K., Global Perspectives -Local Impact: AURAK FIG PILOT TEST. Arthur, R., Garland, G., Assessing the Extent of Flooding along the RAK Coastline as a Result of Sea Level Rise, Tidal Action and Extreme Wave Events. Jallad, A., Takruri, M., Embedded On-board Image Processing for Autonomous Drones. Maalaoui, A., Extensions of the Rabinowitz-Floer Homology and Applications to more General PDEs. Russell, C.D., Transformative Learning: A Case Study of TERM (Teacher Exchange Ras Al Khaimah – Malaysia). Waseem, S., Design and Synthesis of Quinazolinone-amino Acid Conjugates as Potent Pharmaceutical Agents. Merheb, M., Mukhtar, M., Matar, R., Lipid Content Assessment for Biodiesel Production from Mangroves’ Fungi. Khan, L., Social Media for Small Business Development in the UAE. Osa, J., Russell, C.D., Verma, P., Preparing Effective Instructional Leaders: The Impact of Al Qasimi School Leadership Institute.  Verma, P., Russell, C.D., Osa, J., Quality of Early Childhood Education Centers in Ras Al Khaimah, UAE. Puthiyaveetil, A.G., Mukhtar, M., Matar, R., Delineating DNA Repair Mechanisms and microRNA Regulation of Cancer Cells When Treated With Medicinal Plant Extracts. Gauvain, R., Arthur, R., Khan, L., Russell, C.D., Ras Al Khaimah: An Emirates in Transition. Osa, O., Promoting Reading Culture through Arabic Children’s Literature, United Arab Emirates Board on Books for Young People, and Multicultural Children’s Literatures. Ahmad, I., Nanocatalysts for Biodiesel Production from Waste Cooking Oil-Towards Sustainable Energy. Mukhtar, M., Merheb, M., Puthiyaveetil, A.G., Evaluation of Mangrove Plants Growing in Coastal Region of Ras Al Khaimah for their Phytomedicinal (Antifungal) Properties. Merabet, M., Stabilization of the Dispersions of Nanoparticles Dispersions using Electromagnetic means prior to and after the Dispersion Processes. 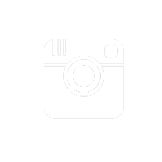 Whatley, H., Social Media and Interactive Reality Television in the Middle East & North Africa (MENA) Region. Lam, T.D., An AURAK Model for a Sustainable Economic Growth of Ras Al Khaimah. Zubairi, J.A., Idwan, S., Load Balancing for Disaster Recovery and Management. Khodr, M., Waller, L., Evaluating and Investigating the Advantages of Flipped Classroom Teaching on Achieving Class Learning Outcomes the School of Engineering. Alshurafa, S., Mohsen, M., Strength and Stiffness Evaluation of Lighting GFRP Poles. Zaid, M., Mohsen, M., Attia, H., Developed Hybrid Water Desalination System Based on Solar Energy in Ras Al Khaimah. Ammari, M.Z., Fowler, R., A Study of the Ideal Grading and Replacement of Manufactured Limestone Sands. Assaf, H., Mohsen, M., Developing a Water Planning Model for Abu Dhabi. Jaber, N., Ismail, M.W.M., An Optimal Policy for a Supply Chain with Unreliable Process to Dispose Defective Items. Merabet, M., Kim, B.S., Dielectric Investigation of the Water Phase Partitioning in Salted and Non-salted Dispersions of Carbon Nanomaterials and Carbon Nanotubes. Kim, B.S., Merabet, M., Development of Direct Numerical Simulation Code of Rotating Ferrofluids in a Confined Cylinder. Puthiyaveetil, A.G., Ahmad, I., Determining the Cancer Prevention Properties of Some Medicinal Plants in the Emirates. Ahmad, I., Sustainable Approach: Catalytic Conversion of Biomass Derived Polyols to Fine Chemicals and Fuel. Arthur, R., Garland, G., Mapping Probabilities of Inundation along the RAK Coastline Resulting from Sea Level Rise. Khan, F., Women Leadership in the UAE: Challenges, Barriers and Strategic Solutions. Pettaway, L., A Study of the Effects of Cultural Diversity on Management and Retention of Human Capital within the United Arab Emirates. Katkhuda, H., Ammari, M., Compressive Strength of Concrete under Accelerated Curing by Microwave Thermal Processor. Assaad, M., Design and Characterization of Differential Capacitive Sensor Based Microsystem for an Accurate Measurement of Water Contents in Crude Oil. Getu, B.N., Hamad, N., Attia, H., Remote Controlling of an Agricultural Pump System based on the Dual Tone Multi-Frequency (DTMF) Technique. Hamad, N., Getu, B.N., Attia, H., Investigating the Electro Magnetic Field (EMF) Radiation Densities of Cellular Mobile Towers and High Frequency Radiations in Ras AI Khaimah. Bdira, E., Cognitive Autonomous Wireless Sensor Networks for Delay Tolerant Applications. Takruri, M., Puthiyaveetil, A.G., Abu Mahmoud, Automated Skin Cancer Detection from Histo-Pathological Images. Jallad, A., Awad, M., Takruri, M., Embedded Hardware Support Vector Machines (SVM) for Satellite On-Board Applications. Abu Jadayil, W., Mohsen, M., Investigation of Solid and Hollow Balls Fatigue Life under Normal and Tangential Loading. Mohsen, M., Solar Still for Water Desalination in Ras Al Khaimah. 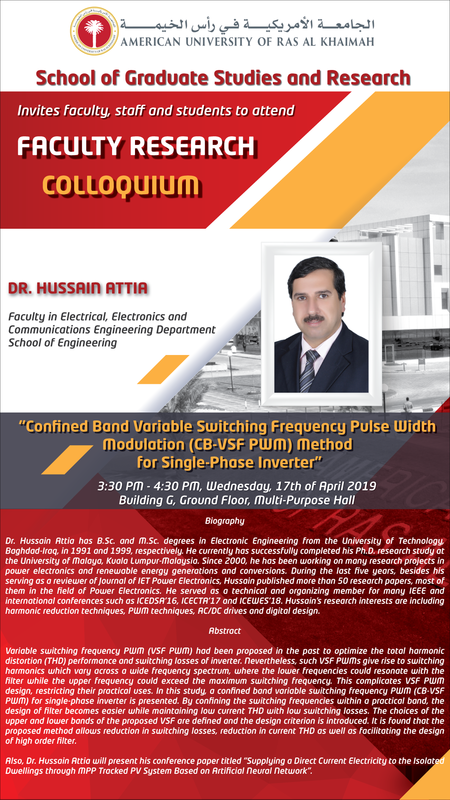 Hussain Attia, Confined Band Variable Switching Frequency Pulse Width Modulation (CB-VSF PWM) Method for Single-Phase Inverter, April 17, 2019. 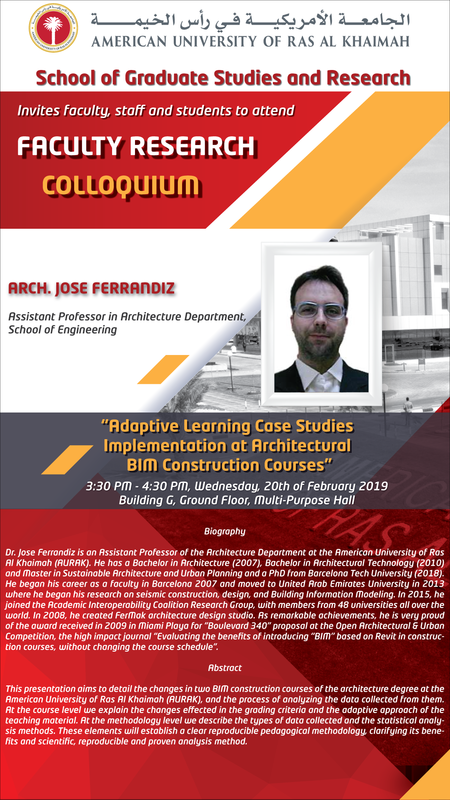 Jose Ferrandiz, Adaptive Learning Case Studies Implementation at Architectural BIM Construction Courses, February 20, 2019.